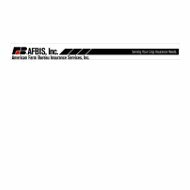 American Farm Bureau Insurance Services, Inc. is not a health insurance company. This company sells crop insurance to farmers. Founded in 1995, American Farm has their headquarters in Schaumburg, IL. Enter your zip code below to get your free health insurance quotes today! American Farm also includes a link for you to find an agency in your area that can help you; however, at this time the link is not working. American Farm does not have any private agents; all of the agents that sell their products are independent agents. American Farm does offer an agent finder tool to make it easier for you to locate an agent in your area. The tool provided by American Farm begins with the option to select a state. The only downside here is they have the option to pick from any of the 50 states, as well as Puerto Rico and the Virgin Islands, when they only sell insurance in the states listed above. At this time, you will choose the county in which you live or where you farm is located and then press the search button. The locator works very quickly and will provide you with all of the agents that service your county. Unfortunately, there is no way to narrow down this search via zip code so that you can first view the agents closest to your location. There does not appear to be any place for you to file your claims online with American Farm Bureau. In addition, they do not provide any forms on their website either. They however, do include the necessary software to make your claims processing easier as you can mark any incidents on maps and spreadsheets provided by the company. It is possible that this information can be printed and simply faxed into to the company for the claim, but there is no indication of whether that is the case on their website. Most crop insurance companies do require you to file your claim within 72 hours of the problem with your crops or livestock and they do not allow you to destroy anything without the adjustor’s permission. American Farm does not offer much in the way of information for potential employees for the company. They do not share their benefits, or show what their job openings are. The do have a brochure to help you determine if crop adjusting is right for you. Another area where this company is unclear about what they offer is customer service. They do not provide a customer service phone number for you to call, nor do they provide their office hours anywhere on their website, although you can probably assume normal insurance/banking hours. In all likelihood, your best bet is to call your independent agent if you have any questions about your policy, claims and so on. There is no quote tool on the American Farm Bureau website. The reason for this is that there are too many risk factors for the company to consider in order to give you a quote. All quotes will have to come through your independent agent. Of course, if you are looking for health insurance quotes, then American Farm is not going to benefit you anyway. In this case, enter your zip code below and get you free health insurance quotes today!